Well, it looks like I won’t have the money for Darrell’s class at William Ng’s school this weekend (or Disneyland either for that matter). I’m pretty bummed. I had to do the right thing and spend my tuition on sailing instructor seminars to further my “real” career. Luckily, the woodworking classes are offered often (I’ve got them all on the calendar), and Mickey will always be there. One thing I’ve noticed is that thewoodwhisperer’s table doesn’t have a lower shelf (probably to lighten up the look), but Darrell’s design does have one. I’m going to opt for the shelf as another place for books, knick-knacks, etc. I’m also going to do the tapered inset vs. the double cloud-lift profile at the bottom of the legs (which means another jig). Very nice tables. You did a great job! I’ve been looking at these two tables too—I like the way the bottom edge of the apron(?) in the WW version is arched and the leg detail is a bit different as well. Love that kind of look. Very masculine. Oops! I didn’t mean to infer that these were my tables, these are the two example tables that I’m using for inspiration. I’m early into the building process. The top one is Marc Spagnoula (aka The Wood Whisperer), and the second one is Darrell Pearts’s (aka Darrell Peart). Marc made his based on Darrell’s design, and I’m not sure where the arch came from, but I like it! Marc attended Darrell’s class at William Ng’s school (which I was hoping to also), and they ended up collaborating on the Hall Brothers’ frame. Now Marc teaches at William Ng! How cool is that? Shortly after that, Marc posted his project. The lines inspired me to buy a truckload of old-growth Honduran mahogany off CraigsList. Looks like those box joints are raised a little. Different and cool. How you think that dark tenon was done. Capt – I think you have the credits backwards, The top photo is of Darrell’s Arched Aurora End Table. The picture is on his website and I think it is in his book too. The bottom picture must be that of the Wood Whisperer’s table. I couldn’t find it on his website so I couldn’t confirm it. Both are very nice tables and excellent inspirations. D’oh! Thanks for the clarification. I thought one was yours and another was Marc’s for some reason. Sometimes I read through them too fast. 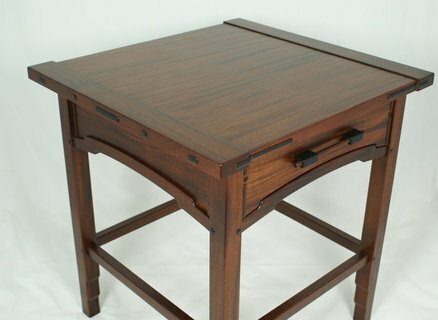 Darrell shows the arched table on his real website, but the plans from American Furniture Design are for the rectangular version. I’m going to modify the design anyway because I’m making a sofa table. I’ve actually been concerned about being able to keep the arch proportions across a longer span. I might build the whole underbody end table size, which would allow me to follow the plan’s dimensions, and let my considerably longer top hang over substantially on either side. This would be faithful to a lot of Greene & Greene pieces I’ve seen.